Karadi Path Education Company Pvt. 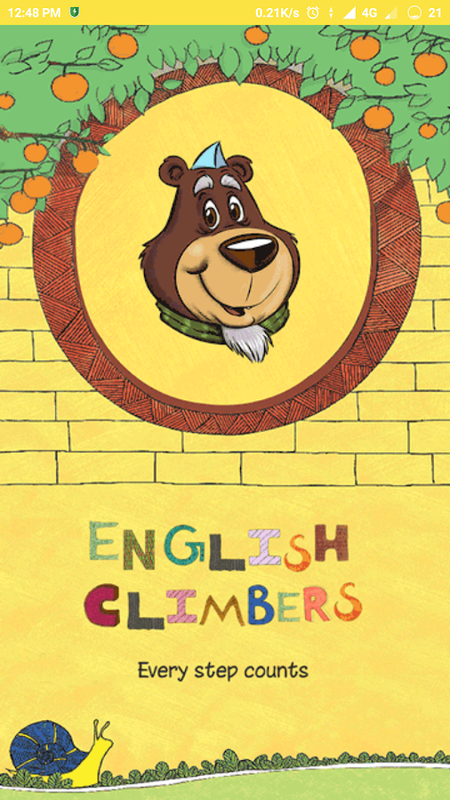 Ltd.
English Climbers introduces pre-school children to theEnglishlanguage in a fun, interesting and interactive way. Giventhat thechildren are at a formative age in their lives, theprogramme isdesigned to help develop cognitive ability andimagination. EnglishClimbers aims to: 1. Introduce children tobasic concepts such ascolours, shapes, numbers and the phonicalphabet throughstorytelling. 2. Recognise non-verbal cues, facialexpressions, andbody language. 3. Help the children form a bondwith colorfullyillustrated books. 4. Use sensory and tactilelearning to introducechildren to English. 5. Develop a spirit ofcooperation andcollaboration. Karadi Path is a unique, creative pedagogy for English languagelearning in the classroom that is easy, enjoyable and effective.Features 1. Mother tongue approach to language learning 2.Zero-resistance learning 3. Intuitive learning processes throughmultisensory, non-linear approaches Take your students on theKaradi Path towards English language learning and see the magichappen! Karadi Path is a unique, creative pedagogy for Englishlanguagelearning in the classroom that is easy, enjoyable andeffective.Features 1. Mother tongue approach to language learning2.Zero-resistance learning 3. Intuitive learning processesthroughmultisensory, non-linear approaches Take your students ontheKaradi Path towards English language learning and see themagichappen! ME SD – TDP extends the strong foundation of the KaradiPathmethodology to teachers in the primary school classroom,includingteachers of Maths and EVS. It provides the teacherswithlearner-oriented classroom ideas to make abstract andcomplexmathematical, science and language concepts accessible tostudentsin English. In order to use the app, you need a valid access code to theFahrAPP within Fragen-Lern-Netz from Wendel-Verlag. These areavailable throughout Germany exclusively in driving schools. ---Get started! Download the app. Log in with the login credentials ofFragen-Lern-Netz and start learning immediately. - Or: Start theregistration process right in the app with your registration codeand fahrschulcode provided by your diving school. The learningstatus is always synchronized - regardless of whether you haverecently learned on a PC, tablet or smartphone. Guarantee! WithFahrAPP you are guaranteed to learn all current questions of theofficial german questionnaire! In all classes and all officiallanguages, including Arabic. Wendel-Verlag is an official licensepartner of TÜV | DEKRA arge tp 21. Rely on our over 50 years ofexperience and go perfectly prepared to your theory exam! Content!Succeed fast with our trainings by first learning the easyquestions. Many more special trainings and of course examsimulations like the real ones at TÜV or DEKRA are waiting for you.So nothing surprises you in the exam! ALL INCLUDED: - All classes:B + A, A2, A1, AM + L, T + C, CE, C1 + D, D1 + moped - Alllanguages: German, Turkish, English, Russian, Arabic, Romanian,Polish, Croatian, Portuguese, French, Greek, Spanish, Italian -Learning tips on every question and in all languages ​ - Voiceoutput of all questions in all languages ​​(except Croatian) -Numerous image and movie versions for all official maternalquestions (variants) - Easy learning, even without internetconnection Attention! Email address and Internet connection(flatrate recommended, otherwise additional costs for datatransmission apply). You can download movies and pictures at homein your Wi-Fi / WLAN to save a lot of data volume on your mobileplan. FahrAPP has an offline mode, with which you can continue tolearn without the Internet. Note on foreign language translations:We use the official translations from TÜV and DEKRA. All questionsand answers are asked in your theoretical exam exactly as in oursoftware. We are happy to pass on translation errors to theauthorities. The Wendel team wishes you lots of fun while trainingand good luck in the theory test! Do you still have any questions?Tap on the support link! Smart Phonics is an easy-to-teach phonics series developed forelementary school children learning English as a Foreign Language.Throughout the five books series, basic phonics skills areintroduced in a simple and systematic way while providing childrenwith efficient tools for basic reading and writing. Smart Phonicsalso introduces a great number of common sight words embedded infun phonics stories and songs. In this way, children can run sightwords naturally and effortlessly. Smart Phonics is an easy-to-teachphonics series developed for elementary school children learningEnglish as a Foreign Language. Throughout the five books series,basic phonics skills are introduced in a simple and systematic waywhile providing children with efficient tools for basic reading andwriting. Smart Phonics also introduces a great number of commonsight words embedded in fun phonics stories and songs. In this way,children can run sight words naturally and effortlessly. You have a TOPIK exam? You don't have time to prepare for the exam?All can be easily with "TOPIK Test", you can try it at anytime andanywhere with your smartphone. Applications is indispensable forthose taking the TOPIK exam. ✓ With a friendly interface, designedin accordance with the exam latest models, clear picture, goodsound. ✓ The tests will be updated after each exam. ✓ Aftercompleting each test, you can view the results (number of correctanswers, points, levels, tables answers ..) ✓ The application isdesigned to target the your desire level: + Topik 1: Level 1, 2. +Topik 1: Level 3, 4, 5, 6. - TOPIK Test will help you study Koreanbetter everyday. AP Panchayat Secretary app vro vra reasoning online exams vro vramodel papers vro vra previous papers reasoning in telugu reasoningapp in telugu రీజనింగ్ యాప్ తెలుగు Reasoning in Telugu Reasoning inEnglish Reasoning shortcuts tricks for all competitive exams withexplanation aptitude and reasoning in telugu aptitude testpreparation , reasoning test preperation Arithmatic online exam ,Reasoning online exam Arithmetic online free mock test , Arithmeticonline tests , aptitude in telugu online free mock tests , aptitudeonline examination , Arithmetic model papers , aptitude modelpapers , Arithmetic aptitude previous papers , reasoning onlineexam bits with explanation , vro vra model papers , vro vra modelquestions , vro vra syllabus , Appsc study material in telugu ,Appsc job notifications , Group 1 group 2 group 3 group 4 panchyatisecreatary , AEE , DSC Telugu , police conistable , sub inspector ,TRT , TET , SA SGT . Ap TET and DSC Telugu telangana Dsc ts state.